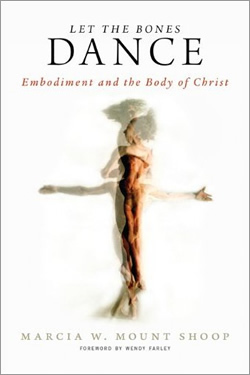 Marcia W. Mount Shoop, Let the Bones Dance: Embodiment and the Body of Christ (Louisville, KY: Westminster John Knox Press, 2010), 184 pages, ISBN 9780664234126. In Let the Bones Dance, ordained theologian-in-residence at University Presbyterian Church (Chapel Hill, North Carolina) Marcia Shoop produces a constructive theology (revised from her dissertation submitted to Emory University under the supervision of Professor Wendy Farley). The project is constructive in several respects. First, Shoop recovers the Schleiermacherian paradigm mostly ignored in conservative circles since Barth’s devastating critique of Schleiermacher’s use of feelings in theology. In Shoop’s recovery, she combines the mapping of feelings with subjectivity, physicality (of the body) and consciousness for the purposes of articulating a theology of the redemption of bodies. Second, Shoop reflects on how she dealt with her personal experiences of sexual trauma, pregnancy and motherhood. Her goal is twofold: to explore the relationship of the feminine body and theology, and to show where existing theological models of conceiving post-traumatic disorder, pregnancy and motherhood in the church fall short of what these experiences can potentially become – a witness for the healing of bodies and for reconceiving a theology of redemption and a theology of the church. Third, Shoop’s project cuts an interdisciplinary edge when she brings her feelings and experience of tragic bodies, relational bodies and ambiguous bodies to bear in proposing a theology of embodied redemption, ecclesiology and worship. Reflecting on her experience as a woman who has survived trauma, lived through pregnancy and overcame the ambiguities of motherhood, Shoop proposes to see feelings as “a grammar of our body language” (p.11). Through feelings, one understands one’s body. Feelings are not limited to emotions and sensations. Rather, feelings as a mode of experience are the ground of all primal and embodied experiences. Feelings define, shape and condition us in ways that also beyond the realms of consciousness. Shoop’s notion of feelings differs from Schleiermacher’s gefühl (of God-consciousness) and Whitehead’s conception (as universe’s structure/function) in that she conceives of feeling as the mechanism for the redemption of the bodies. The redemption of the body entails attending to feelings and bodily functions and responding to the body. The redemption of the body occurs also by paying attention to how relationships build up through simple feelings and consciousness. Shoop reminds her readers how impossible it is to retell one’s story fully; a narrative is by its nature an activity that both conceals and reveals. The limits of language, thought, memory, analysis, listening and speaking all point to this reality that no narrative can ever be exhaustive. For instance, the experience of trauma makes it difficult for the victim to synthesize and articulate the event clearly. Sexual assault carries a sense of loss, of harm and of grief, which are impossible to report objectively. As a result of tragic events, the body instinctively produces mechanisms for the rejuvenation of bodily health: feelings become the body’s mechanism for surviving the tragedy and for the redemption of the body especially in the aftermath of trauma. In another instance, pregnancy becomes the ground for connecting God’s promises of life with the reality of our bodily finitude within the relational web of “contorted subjectivity” and “entangled subjectivity” (p.79). Feelings connect the woman with God (and God’s creativity) and with others in the midst of labor pains, thereby demonstrating the capacity of pregnancy to function as an icon for connectivity (p.90). During the course of pregnancy, the woman responds to bodily changes even as she discovers her entangled relations with the baby in her womb. And in the third instance of motherhood, a woman encounters ambiguity with promises and perils lurking at its door. Motherhood is not just about nurture and self-sacrifice (roles commonly associated with good mothers) but motherhood entails also the prospect of negotiating open spaces and possibilities for cultivating hope amidst ambiguity, indeterminacy and multiple other roles mothers play in a relational web. The “intense rhythm of mothering” (p.103) includes sensitivity to the layers of meanings behind frenetic activities dealing with the “everydayness of human life” (p.103) – the fusion of the sacred with the mundane in the embodied functions of motherhood. TW writes: “A Woman’s voice gives new insight to Body Life in ‘Let the Bones Dance'”. TW writes: "A Woman's voice gives new insight to Body Life in 'Let the Bones Dance'".